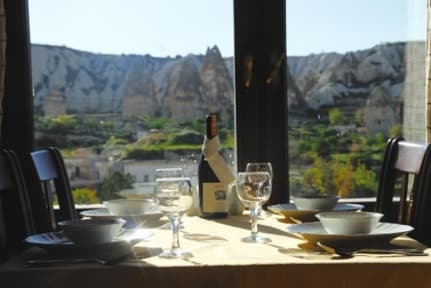 Guven Cave was an amazing place to stay - Mustafa was incredibly attentive, helped us get dinner, book our hot air balloon ride, and even gave us some local tips on hikes. The location was great, room was clean and comfortable, and price reasonable. 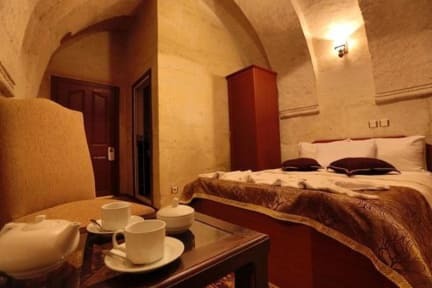 I would certainly come back, and recommend Guven to anyone traveling to Cappadocia! We had a great stay here! And the service was out of the world! We actually just went to Cappadocia for 2 days (to try the hot air balloon) - but since we came 1 day earlier, Mustafa was kind to tell us what we could do for the day. Unfortunatly all the airballons were cancelled because of some bad weather forecast, so when we could'nt get a cab to drive us around the area, Mustafa steped in and drove ud aorund for 4 and played our tourguide as well! Lovely place! Incredible hotel with amazing friendly staff who will go above and beyond to help you with anything. We had a great stay at Guven cave hostel. This place is very well located-only 5 minutes walk from the bus station and the center of the town. The view from my room was unforgattable. The room was clean and comfortable. The breakfast was very good. Mustafa, the owner of the hostel, was very helpful and nice. He helped us book our balloon ride with a great company and recomended us a nice restaurant as well as great spots to do some trekking. We had a great time in Cappadocia. Thank you!! Mustafa was great and helped out with all arrangments and recommended great food!